I enjoyed the original "Twin Peaks" series a lot. I watched it when it ran the first time. The new one is good, but it's very slow and weird. I think the first series benefited from some network interference or pressure, maybe? It was more watchable, to me, than this new one. If you like really odd shows, you may love this one. One of the main problems I have with the series is that we don't get to see the good guy, Dale Cooper, who was one of the main reasons to love the old series, very much. Another problem I have is that they didn't get Michael Ontkean back to play Harry. He and Cooper were the best thing about the original series. I'm glad they were able to get most of the others back. I'm glad to get this DVD set so that I could finally watch the series. I don't get Showtime. Also, it has many great extras to watch, which I enjoyed. It's worth buying if you're a fan of the original series, but you can watch it and enjoy even if you've never seen the original because it's a separate story all on its own. The first two seasons of the surreal, suspenseful cult TV series co-created by auteur David Lynch aired in 1990-91. In 2017, Twin Peaks came back to television, picking up 25 years after the shocking murder of homecoming queen Laura Palmer. 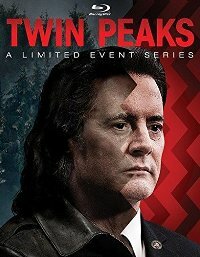 Golden Globe winner Kyle McLachlan returns in his original role as Dale Cooper, with several twists, in a layered, cryptic TV event critics praised to the skies. This collection includes a wealth of exclusive, behind-the-scenes special features that will show fans what's behind the red curtain and the making of this extraordinary television event. "The most groundbreaking TV series ever"--Rolling Stone. 17 hrs., 8 DVDs or Blu-ray discs. Mature audiences.